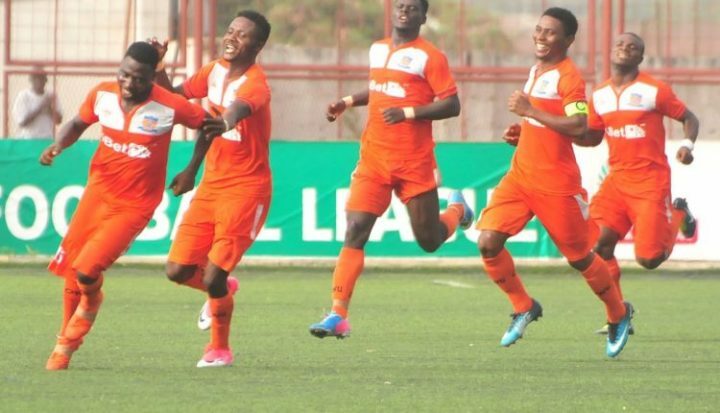 Sunday Chinedu’s goal in the 72nd minute was enough to seal a point for Kwara United in Akure as they held Sunshine Stars to a 2-2 draw in one of Wednesday’s fixtures in the NPFL. The Harmony Boys took the lead in the first half through Alfred Stephen before falling behind 2-1 in the second half to superb freekicks from Sunday Emmanuel. It was a bright start for the home team. Stand-in captain Dayo Ojo shot off target in the 11th minute and minutes later Sunday Emmanuel got a chance to shoot Sunshine Stars in front, but his effort was calmly gathered by goalkeeper Chidiebere Eze. Kwara United responded with a chance of their own through Issa Magaji but his shot went off target. However, the breakthrough came for United in the 20th minute when Michael Ohanu’s pass into the box found Alfred Stephen. Goalkeeper Ayodele did well to save Stephen’s first effort, but was helpless on the rebound which gave United the lead. Eighteen minutes later, Sunday Emmanuel equalised for the Akure club with a well-taken freekick after Abiodun Joseph was brought down at the edge of the box. Few minutes into the second half, substitute Sikiru Alimi missed a chance to shoot the hosts into the lead with a simple tap in as he failed to connect to a pass from Sunday Emmanuel. Sunshine continued to dominate the game but found it difficult to convert their chances. The visitors came close to taking the lead in the 52nd minute, with Ohanu needing only to beat Ayodele, but his shot went over the bar. Kwara United captain Akeem Onigbari went into the referee’s book for a foul on Franklin Sasere. The resulting freekick was once again converted with a well-taken strike from Sunday Emmanuel for his second and Sunshine’s second of the game sending the home fans into jubilation. The visitors continued to pour forward in search of an equaliser and they got rewarded in the 72nd minute after unmarked Sunday Chinedu rose high to head in from a corner kick. The result leaves Sunshine 17th on the NPFL log, while Kwara United remain 20th.